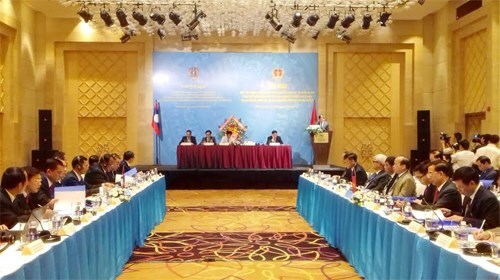 Khanh Hoa (VNA) – The Vietnamese and Lao police held their seventh conference on cooperation in preventing and fighting crimes and ensuring social order and safety in the central province of Khanh Hoa’s Nha Trang City on July 6. Opening the event, Lieutenant General Pham Van Vinh, Chief of the General Police Department of the Ministry of Public Security, said that over the past years, the regional and global security, political situation and social order have developed complicatedly. Besides, trans-border and organised crimes, such as terrorism, drug and human trafficking have directly effected the socio-economic development as well as national security and social safety and order in both Laos and Vietnam, he noted. These events require the police of both countries to ceaselessly renovate and improve their cooperation mechanism and contents, stated Vinh. During the conference, the two sides reviewed their current cooperation and outcomes as well as their experience in the work. They pointed out both successes, and shortcomings, difficulties and obstacles in their partnership so far. Both sides agreed on a number of policies and measures as well as specific targets to further enhance their affiliation efficiency in the future. They will strengthen the exchange of information in investigations relating to drug and human trafficking, terrorism, the environment, smuggling, and the hunt for wanted criminals, thus contributing to safeguarding the social order and safety in both countries. At the same time, they also concurred to focus on cooperation in investigating and searching for wanted crimes fleeing from one country to the other, as well as trans-national swindlers and cyber criminals. They will foster connection in administrative management over social order, while boosting multilateral cooperation with the Interpol and Aseanapol, thus enhance the position, role and influence of the police forces of Vietnam and Laos in these organisations. The conference also includes a number of activities that will last until July 8.